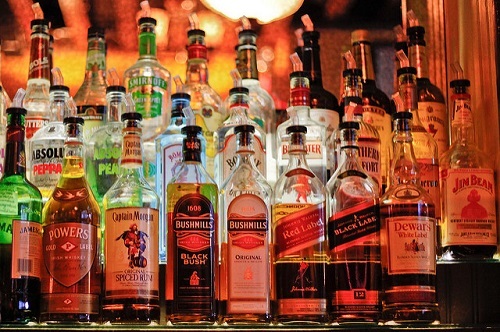 Most people associate the term ‘liquor’ with alcohol. While it is true that liquor has alcohol content, not all alcoholic drinks are liquor. This may seem odd, but the differences are actually significant. To understand the difference between alcohol and liquor, the history, development, and categories of both should be examined. ‘Alcohol,’ in chemical terms, is a liquid organic compound. It evaporates more easily than water. It is soluble, dissolving in water readily. Due to its chemical makeup, alcohol is highly flammable. Pure alcohol is not ingested; even a little bit of pure alcohol, if consumed, is enough to raise the alcohol content in the blood to catastrophic levels. There are different types of alcohol based on how it is formed. Alcohol formed from natural gas, oil, or other fossil fuels is categorized under industrial alcohols, as they are most often used for industrial purposes. It can also be created from adding hydroxyl to carbon atoms and/or hydrogen atoms. The most common of these are methanol (i.e. wood alcohol). Finally, through fermentation, alcohol can be distilled from fruits and grains, which produce ethanol. Ethanol is the form of alcohol that is found in alcoholic drinks – this last category is where alcohol and liquor intersect. Drinking alcoholic beverages can be traced as far back as 10,000 BC or earlier. There is empirical evidence that men used vessels to ferment drinks from fruit. China is perhaps the oldest civilization that has evidence of alcoholic beverages being part of its inhabitants’ daily lives, dating back to around 7000 BC. There are existing relics of containers such as jugs and jars and wine presses from ancient Egypt and Persia traced back to 4000-5000 BC. Drinking alcoholic beverages was often part of daily life; it was the beverage of choice for social functions and events, as well as religious/spiritual practices and traditions. For instance, the Greeks have a deity of wine and merriment – Dionysus (Roman equivalent: Bacchus). As far back as these early times, the consumption of alcoholic beverages was a common practice in any culture of the world. From this practice, distillation of liquors came about. This is where the difference between alcohol and liquor becomes clear. Liquors, also called ‘spirits,’ concentrate the alcohol in fermented fruits and grains through the process of distillation. This is the reason why not all alcoholic beverages are classified as liquor. Beer, for example, is an alcoholic drink, but it is not liquor, per se, as it is produced through fermentation. The term ‘liquor’ originated from the Latin term ‘liquere,’ which means ‘to be fluid,’ but it was not used for alcoholic beverages until the 16th century. However, the practice of distilling alcoholic beverages was evidenced even earlier, around the 12th-13th centuries in parts of Europe and Asia. During this time, brandy and whiskey were developed; though, interestingly, for medicinal purposes instead of for social drinking. It would be another couple of hundred years before the discovery of distilling liquor from barley and wheat was made. Alcohol and liquor are also categorized by their ethanol content (also known as ‘proof’), which is measured by the percentage in the beverage. Beer and wine have a relatively low ethanol content (from 4-15 percent), whereas liquors are more concentrated – gin and vodka, for example, can have as much as 95 percent ethanol content. 1.’Alcohol’ is a more general category and can mean different industrial, medicinal, or recreational functions. 2.’Liquor’ refers solely to beverages with alcoholic content. 3.Alcoholic beverages can be produced through fermentation of agricultural produce such as fruits, grains, and vegetables; liquor is produced by first fermenting these, and then concentrating the ethanol through the process of distillation. 4.Liquor has higher ethanol contents than other types of alcoholic beverages. Celine. "Difference Between Alcohol and Liquor." DifferenceBetween.net. June 21, 2018 < http://www.differencebetween.net/miscellaneous/difference-between-alcohol-and-liquor/ >.